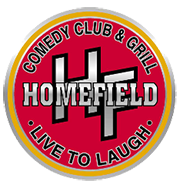 Homefield Comedy Club is Miami's only full time comedy club offering national comedians 52 weeks a year. Homefield is located at 8575 SW 124th Ave in Miami -- we also have a full menu of delicious food, hamburgers, steak, wings, beers, local beers, and much more! Hurricane Grill & Wings is unlike any other Chicken Wing Restaurant! Just walk in, take a seat, kick back, and experience a world of delicious food, exhilarating flavors and no worries.